The recent growth resurgence in Africa has dominated the news in the media as well as debates in the development community over the past years. This growth resurgence has important features that are distinct from previous growth accelerations, and inspire the optimistic view that, maybe, Africa could be on a path of more sustained growth. A key feature is that, unlike previous growth episodes, recent growth is not just a natural resource story; in particular, it is not just an oil story. Many among the high growers are resource-poor countries whose economies are primarily agriculture-based, such as Ethiopia, Malawi, Rwanda, Uganda and others. Even in the case of oil producers such as Nigeria, agriculture has emerged as a substantial contributor to growth. If Africa is to “conquer the 21st century” it has to rekindle its love for its agriculture. In the inaugural lecture of the Speaker Series of the African Development Policy program at the Political Economy Research Institute on 22 February 2013, Professor Calestous Juma of Harvard Kennedy School charted a new strategy for Africa’s future based on technology and innovation-driven agricultural development. In his recent book, New Harvest: Agricultural Innovation in Africa, Calestous Juma provides a blue print for an agricultural development strategy based on four pillars: science and technology, infrastructure, technical capacity, and entrepreneurship. But for this strategy to succeed, it needs new institutions to implement the programs, and, most importantly it requires a developmental leadership that can unify the various centers of decision making (e.g., ministries) and mobilize resource allocation around the agriculture development agenda. The agriculture-based development strategy in Africa will need a champion in two respects: a policy champion and a financing champion. From a policy perspective, there is a need to urgently reverse the marginalization of agriculture in national development strategies as observed over the past several decades. While African governments and their development partners have rhetorically proclaimed the critical importance of agriculture for growth and poverty reduction, the sector has remained a parent pauvre[i] in resource allocation. Although consistent data on sectoral public expenditure, especially on agriculture, are scarce, the broad picture is quite clear. 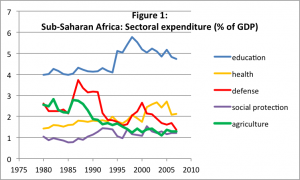 Over the span of twenty years from 1986 to 2007, expenditure on agriculture as a share of GDP in sub-Saharan Africa (SSA) declined by half from 2.8% to 1.3% (Figure 1). The 1980s and 1990s saw a dramatic decline in government spending on agriculture, with the share of agriculture in total government spending declining from 9.6% in 1980 to 4.3% in 1998. The ratio has increased since then, reaching 8.2% in 2007, but it remains much below the target of 10% that African countries agreed upon in the 2003 Maputo Declaration. [ii] A background report to the FAO’s flagship publication The State of Food and Agriculture 2012 concludes that “trends in government spending for countries in sub-Saharan Africa are discouraging” and adds that these trends “are discouraging in that they indicate a failure of government budgets to prioritize agriculture”. [iii] According to that background report, spending on agriculture per “agricultural population” (population working in agriculture) is lowest in sub-Saharan Africa compared to other regions. It adds that the agricultural orientation for government spending –the share government spending on agriculture divided by the share of agriculture in GDP – is also lowest in SSA. This policy bias against agriculture in Africa is decisively problematic. At the same time, external assistance targeted to agriculture has been inadequate. The sector accounts for less than 5 percent of total aid from the Development Assistance Community. [iv] The ratio has increased somehow recently, from 3.5% in 2002 to 4.9% in 2010. However, with the growing pressures on donor budgets, it is not clear whether the momentum will be sustained. For budgetary allocations to agriculture to increase, both domestically and internationally, agriculture’s place on the policy maker’s preference mapping needs to rise substantially. In other words, agricultural development in Africa needs a policy champion. On the private sector side, agriculture has never been a darling of domestic banks in Africa. According to a study on the financial sector in Burundi agriculture receives less than one percent of total bank credit, although it contributes over 40 percent of GDP and employs more than 85 percent of the population. [v] External private financing for agriculture is still inadequate to bridge the financing gaps. Concerns over “land grabbing” by foreigners notwithstanding, the sector remains pretty much outside of the radar screen of private financiers both domestic and foreign. It sorely needs a financing champion. So, how is the policy champion going to emerge? In principle it should be instinctive for any good policy maker that agriculture is central for African development. It is essential for poverty reduction. Hunger and malnutrition continue to haunt a large number of African children today. During his latest visit to Burundi, the EU Commissioner for Development, Mr. Andris Piebalgs, was introduced to the harsh reality of high child malnutrition (35% of the under-five children, the 6th highest in the world). [vi] Obviously, decades of civil war have a lot to account for that, but the more structural problem is inadequate investment in agriculture. Agriculture is also a major stepping stone for industrialization. Scaling up investments in agriculture will raise productivity, release surplus labor and feed industry with raw material. The ongoing leapfrogging of African economies from agriculture to services is inconsistent with the employment requirements and food security needs of the continent. While individual policy makers may understand the centrality of agriculture, the challenge is to build a national coalition around the agenda. This requires the supreme authority to embrace the notion of centrality of agriculture and ensure that it trickles down to all levels of the bureaucracy. In addition to a policy issue, elevating the standing of agriculture in national development strategy is also a philosophical issue. In his lecture, Calestous Juma noted a stunning peculiarity of African agriculture that sets it apart from other sectors. While African schools train medical students who go on to become health practitioners, law school students who become lawyers, education students who become teachers, etc., most of those trained in agriculture end up “growing bureaucracies” rather than growing food crops. Therefore part of the agriculture development strategy must be a new capacity building strategy for agriculture centered around innovation, science and technology that maximizes synergies between training, research and applications. In our subsequent posts, we will discuss the need for a financing champion for Africa’s agriculture. Keep on reading. [i] « Parent pauvre » or « laissé pour compte » in this context means “receiving inadequate attention”. [iii] Lowder, Sarah K. and Brian CArisma (2011) “Financial resource flows to agriculture: A review of data on government spending, official development assistance and foreign direct investment.” FAO, ESA Working Paper No. 11-19. [iv] World Bank, Africa Development Indicators (www.worldbank.org). [v] Nkurunziza, Janvier D., Léonce Ndikumana, and Prime Nyamoya (2012) “The Financial Sector in Burundi” NBER Working Paper 18289. I have read some good stuff here. Definitely price bookmarking for revisiting. I surprise how a lot effort you put to make this sort of wonderful informative website.